"A thriller set against a dramatic historic background. Powerful!" The Columbia Review. 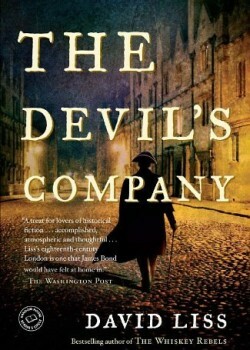 To fans of novelist David Liss The Devil’s Company is a wonderful encore. Benjamin Weaver, the Jewish pugilist-turned-detective, returns to action against a new and mighty adversary – England’s most powerful organization, the East India Company. Following in the footsteps of Liss’s Conspiracy of Paper (winner of Edgar) and Spectacle of Corruption, Weaver becomes entangled with dangerous people whose agenda and wickedness are reminiscent of modern-time global business titans. Friendship, love, betrayal, and outright violence keep the story moving–both in velocity and emotionally. Especially in these modern days of economic upheaval and reckless corporate greed, it is fascinating to go back in time to an era when men did business without cars, planes, telephones or emails, and watch Weaver expose the gritty underpinnings of Victorian-age global trade and its loathsome-yet-delicious characters. If you enjoy thrillers set against a dramatic historic background, The Devil’s Company would provide hours of nail-biting pleasure!